Caravan fridges are simple appliances that shouldn’t go wrong if well looked after. Follow these tips and your food will always be hygienic and your drinks well chilled in even the hottest weather on site. Most modern caravan refrigerators are absorption fridges with no moving parts. They use one of three power sources - a gas flame, a mains electric element or a 12-volt element from the car’s electrical system when the engine is running. The latest models have an automatic setting, which selects the most appropriate energy source. Before using your refrigerator, read the operating instructions thoroughly and adjust the thermostat according to the weather conditions. It helps to pre-cool the food compartment before taking to the road. Load up some non-perishable items like bottles of mineral water and keep the refrigerator running for three hours or more on either mains or gas. When adding the perishable items, leave plenty of space around them. Never over pack the compartment. Finally, double-check the door catch, then switch to 12V operating mode. The 12V operation is for ‘on the road’ use and will only operate when the towing vehicle engine is running, but it is not a ‘second best’. Cooling in this mode is just as good as it is on gas or mains. Ensure the silvered cooling fins at the back of the food compartment are unobstructed. Their job is to absorb heat from the enclosure. Do not cover them with a pack of canned drinks or shrink-wrapped products. On a crowded holiday park, you sometimes get a voltage drop on mains hook-ups. A supply as low as 190V will affect refrigerator operation. If cooling is disappointing on mains, reverting to gas operation may improve performance. This also applies abroad, since electrical regulations may be different to those in the UK and the supply voltage may be considerably lower than 230V. Caravan refrigerators can be operated on both types of LPG but it is important that the gas pressure shown on the data plate corresponds with your gas regulator. Because of safety risks, it is strongly recommended that you do not operate on bottled gas whilst on tow. A naked flame is prohibited at petrol stations, motorway service areas and in most tunnels. Crossings of an hour or two, the contents should remain adequately cool until you are able to re-connect, provided the refrigerator was pre-cooled sufficiently beforehand. For longer crossings, this is not practicable, and it is best to purchase fresh produce on arrival at your holiday destination. You can, however, pre-freeze items for consumption within a couple of days at your destination. A well-packed fridge with no air spaces will keep items frozen from at least 12 hours – depending on the ambient temperature outside. Cooked meals and staples like bread and milk are ideal for freezing and will keep the fridge compartment well chilled while slowly defrosting for use at your destination. Fill the fridge to capacity, if possible, and avoid opening the door. Always remember to empty out the refrigerator between trips – food items left in the fridge for long periods could contaminate the unit. After disconnecting and defrosting, clean the fridge using a soft cloth and warm (not hot), weak solution of bicarbonate of soda. Finally, wipe over with a cloth and plain water and finish with a dry cloth. If something has left a strong odour in the fridge which washing alone cannot shift, try making a paste out of the bicarbonate of soda and water, and smear this in the refrigerator and leave overnight. Rinse off with warm water, clean and dry - this should cure the problem. For Dometic and Thetford refrigerators, a winter cover is available to fit over the ventilator grilles. This can be used when the refrigerator is being run on gas as well as mains. However, this may not be the case with other manufacturers' covers - if in doubt consult your dealer or caravan manufacturer. 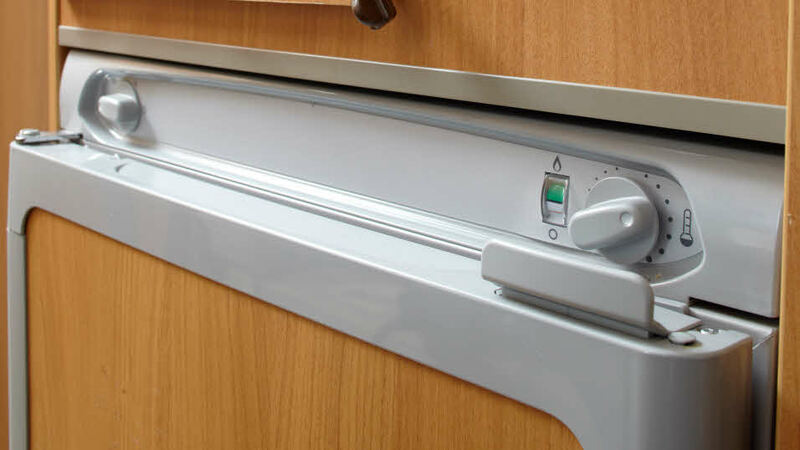 The covers help to control the performance of the refrigerator in cold conditions and should ideally be fitted when the outside (ambient) temperature is below 10ºC (50ºF) for Dometic refrigerators and below 8ºC (46ºF) for Thetford refrigerators. They should be removed when not required, otherwise the performance of the refrigerator could be adversely affected, particularly in warm weather. Like any gas-operated appliance, a refrigerator must be serviced at frequent intervals, and an annual service is recommended. A service once every two years should be adequate. A full refrigerator service entails removing the refrigerator and cleaning the burners, flue, baffle and associated items, replacing the gas jets and checking the ignition system. This should only be undertaken by a suitably qualified service engineer. When not in use, the refrigerator door should be left ajar – some fridges have a special catch to maintain the air gap to prevent mould growing inside. Ensure the ventilation openings are unobstructed, and that winter covers are not used in the summer (other than for storage). The door should be secured by means of the travel catch when the caravan is on the move. the car engine is switched on (if relays are fitted). the fuse is intact in the refrigerator plug or spur socket.